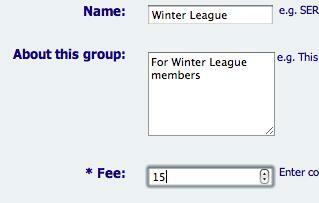 You could manage this all manually - for example by keeping a list of league members in a spreadsheet somewhere. You could then set two prices for your events: members and non-members, where the latter includes the league joining fee. Entrants choose which fee to pay, and you check against your spreadsheet to make sure they paid the right one, and collect it later if they didn't. Finally you update the spreadsheet each time someone joins, online or offline. By the way, a quick way to list lots of events, is to list the first one, then click the 'List a new event like this' link in the top right of the event page - this will copy most of the details, so you only have to change the ones that are different (such as the start date). 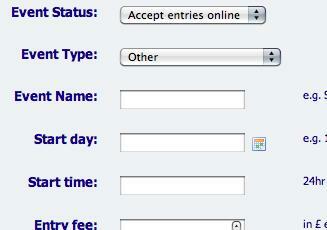 It even copies the payment details, if you're the organiser of the event you are copying. Entrants simply fill in your group entry form (if you have one) followed by your event entry form, and pay for both in one go. Meanwhile, from the group page, you can view group members, email them, update their details and so on. For example, you might assign each member a unique number, which stays with them throughout the series. You can also add members manually (for example if they paid in person, on the day).